Time comes to revisit a couple of furballs from my “Cats of University Heights” series: Biscuit, Frenemy, and Slumber. As an unabashed amateur photographer, I tend to avoid putting the capture’s subject in the centerfield. But sometimes, there is no other choice or such placement pleases the eye—so I believe (gulp) about these two portraits. Both animals live on different blocks along Maryland Ave. The Featured Image gives better view of the black cat who is Morla the tortoise’s front-yard companion. 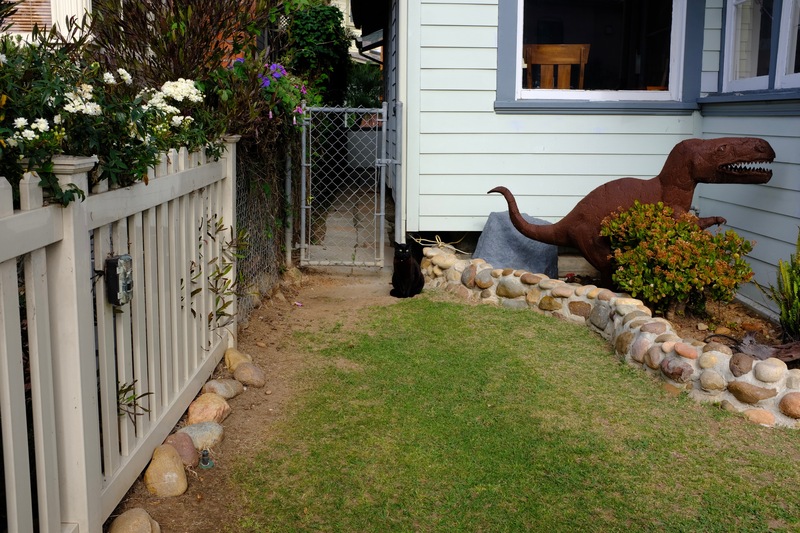 The fence leads the eye down to the feline, which offset dinosaur adds character to the yard. The JPEG is straightened but otherwise as shot today using the Fujifilm X100F, with Velvia film simulation applied in camera. Vitals: f/5.6, ISO 200, 1/420 sec, 23mm; 9:38 a.m. PDT. The tiger tabby is an unedited HDR taken with iPhone 7 Plus on Feb. 7, 2017 at 4:17 p.m. PST. Vitals: f/8, ISO 20, 1/825 sec, 3.99mm. 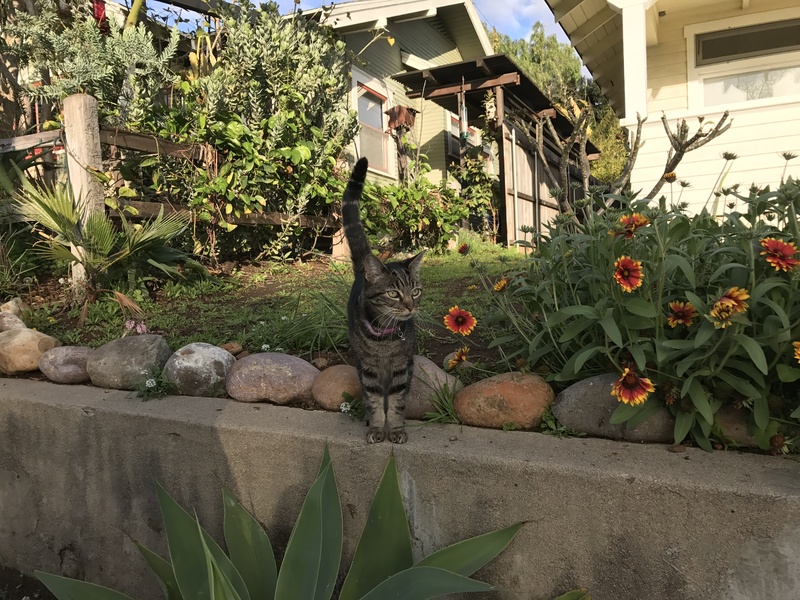 The cat’s posture, set against the backyard and alongside blazing orange flowers, makes the shot work. I shot the last of the three this afternoon, hours after posting, and updated the entry. 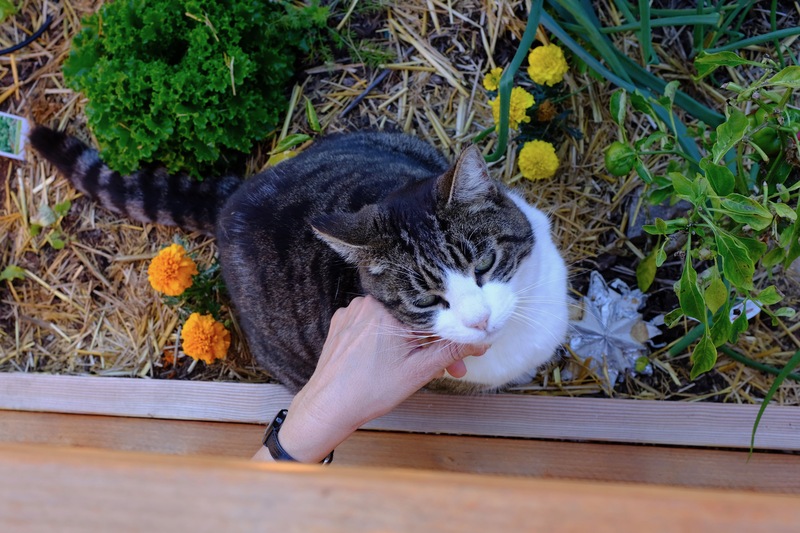 My wife’s hand petting the kitty through the fence makes the center placement. Hehe, or so I say. This is another X100F and Velvia capture. Vitals, with manually set aperture: f/5.6, ISO 250, 1/60 sec, 23mm; 4:34 p.m. PDT.